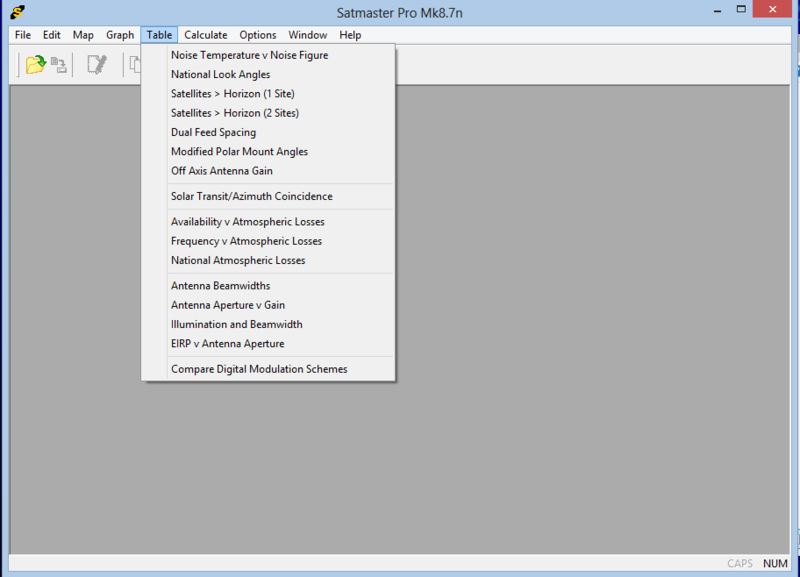 This is the most complete satellite communications reference tool available. 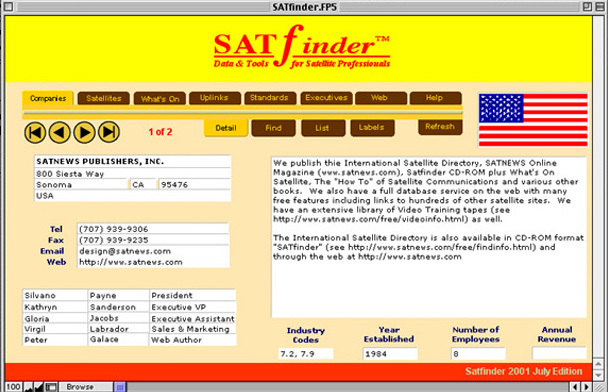 SatFinder includes a complete reference to the industry as well as remarkable calculation tools. 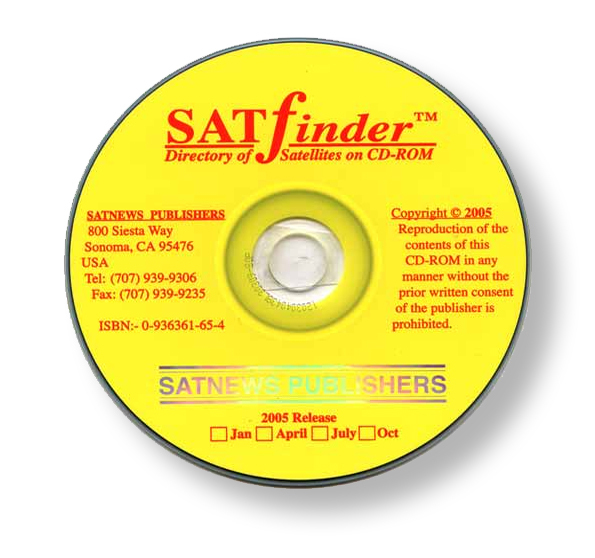 A single CD contains two comprehensive sections. Has information on over 500 satellites (orbital location, frequencies, EIRP, G/T, SFD, bandwidth, programming etc.) and 9,000 companies (address, tel, fax, web, products, services and contact names etc.) and 19,000 executives in the commercial satellite industry. Containing a very fast search ability plus over 800 hundred EIRP, G/T & SFD maps in color not published anywhere else. Used by Broadcasters, SNG operators, VSAT designers, dish installation companies and dealers serving the satellite TV industry. Calculation capacity including dish aiming, link budget analysis and solar outage prediction provide the backbone of the package. The link budget facilities employ rain attenuation and atmospheric absorption prediction modeling even for low elevations. These and other useful features, such as an integral magnetic variation calculation and over 30,000 stored town/city coordinates, combine to enable a system to be either designed for any global location. Designed to be very simple to use, it works just like any other Windows application with pull-down menus, toolbar for shortcuts, dialog boxes, text and graphics windows, a status bar and a comprehensive help system. 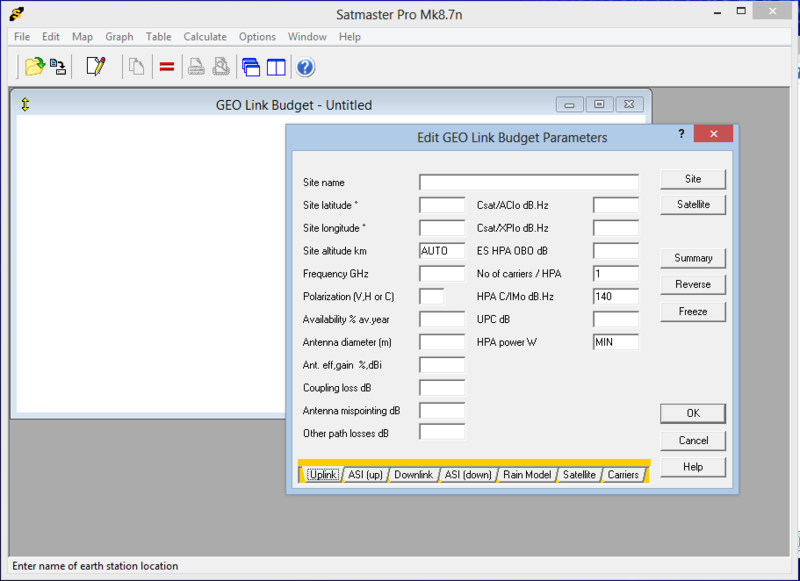 Digital link budgets for Satellite TV, SNG, radio and data. 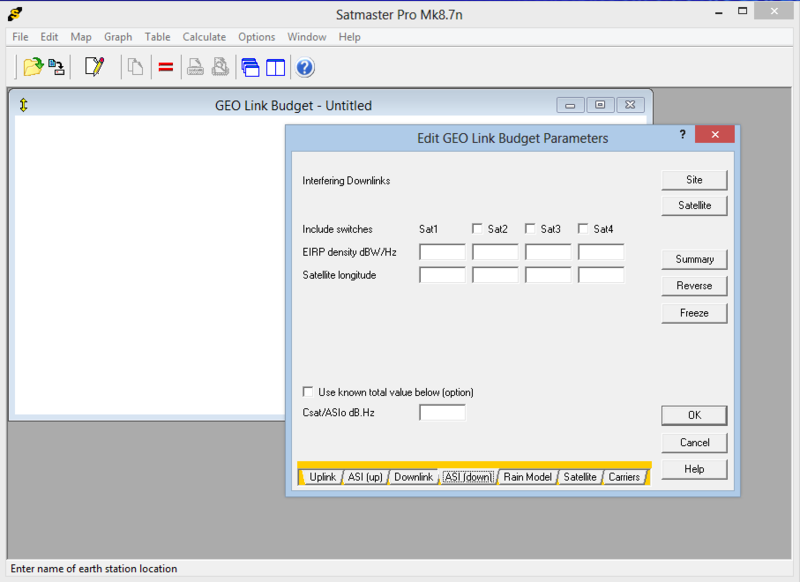 Link budgets for P,L,S,C,X,Ku,Ka and K band. Sun outage prediction (single site and satellite). Sun outage batch file handling (multiple sites or multiple satellites). 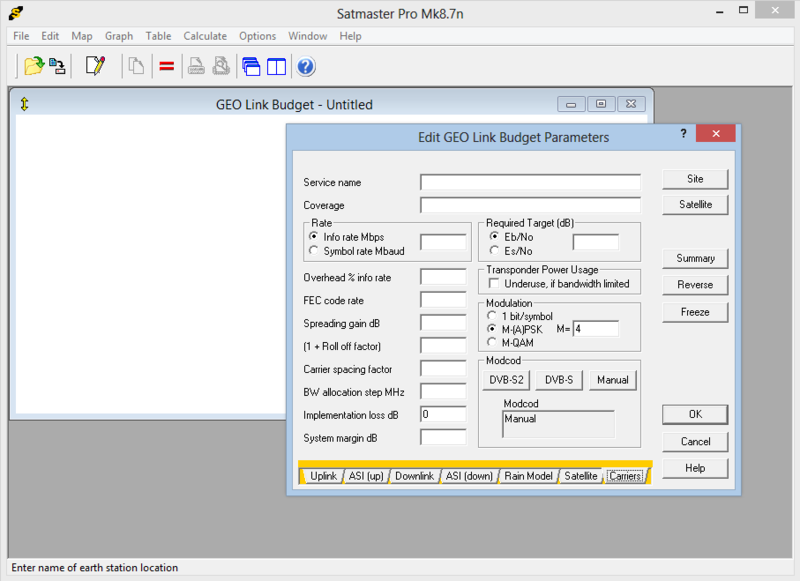 EIRP, SFD and G/T map viewer. Automatic altitude and magnetic variation calculation. Cloud attenuation model (ITU-R P.840, significant at Ka band and abuve). Calculates atmospheric absorption and tropospheric scintillation losses. 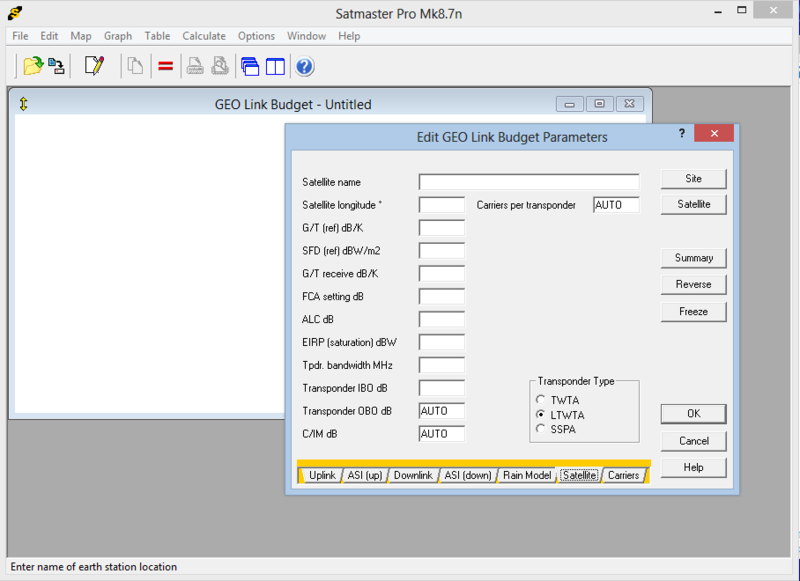 Four satellite, ASI calculator within GEO 'bent pipe' link budget modules. 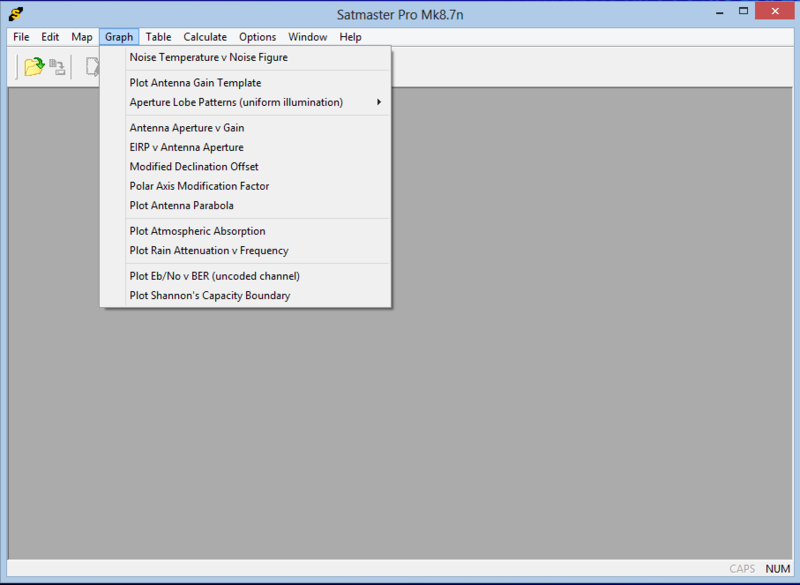 Automatic 'Antenna Noise' calculation option. Tabulation of R0.01 values and rain attenuation for a selected country. Highlighting of key link budget results. Polarization offset shown in 'Satellites above Horizon' listings. 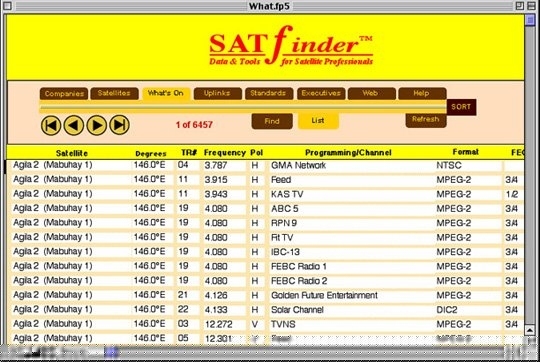 Numerous satellite based calculation tools such as G/T, off axis antenna gains and DVB-S2 bandwidth. 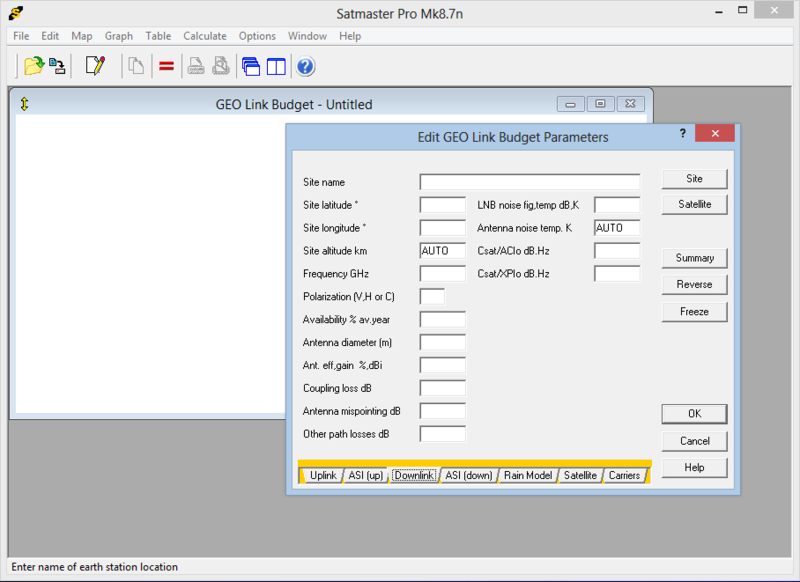 Full up-down digital link budget calculators with provision for interference input, uplink power control (UPC), ALC, E.S. intermodulation. interference and multiple carriers per HPA. Finds HPA size, uplink power requirements, bandwidth and power usage per carrier. 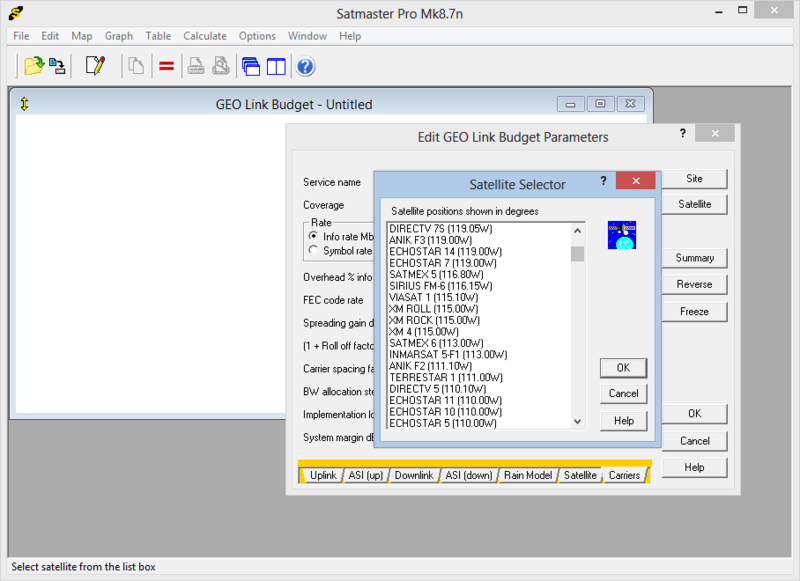 Calculates atmospheric losses and rain fade margins for any desired availability on uplink and downlink. Optional auto-estimation of output back off and transponder intermodulation interference. Handles BPSK, QPSK, M-PSK/M-APSK or M-QAM with any FEC code rate. Determines if transponder is power or bandwidth limited and calculates the power equivalent bandwidth if appropriate. Handles DVB-S, DVB-S2 (inc adaptive systems) and Turbo codes. Separated uplink and downlink link budget modules for use with regenerative transponders. The latter may also be used for approximate dish sizing with bent-pipe transponders. The software uses the ITU-R P.618 model with 40 year ESA v5 rain data (ITU-R P.836). This rain model uses a higher resolution 1.125 degree interpolated grid. It is also possible to enter locally obtained R0.01 values in mm/h. Calculates cloud attenuation using ITU-R P.840. Calculates tropospheric scintillation losses and absorption by atmospheric gases. 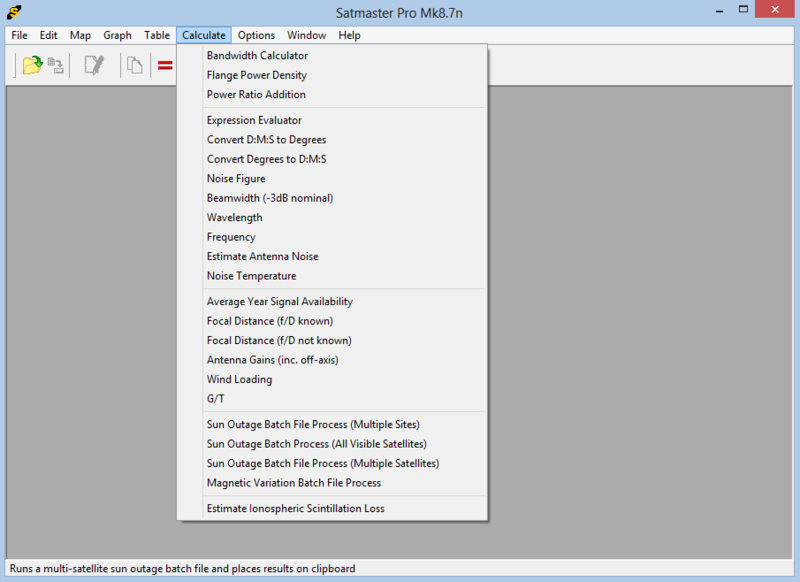 Quickly calculate XPD, rain attenuation and noise increase due to rain for use with other software and spreadsheets. Tabulate rate tables for any selected country. Calculates elevation, true azimuth, compass bearing and polarization offset for any geostationary satellite from any location. No need to know magnetic variation values, it's all automated. Finds minimum and maximum antenna elevation for satellites in inclined orbits. 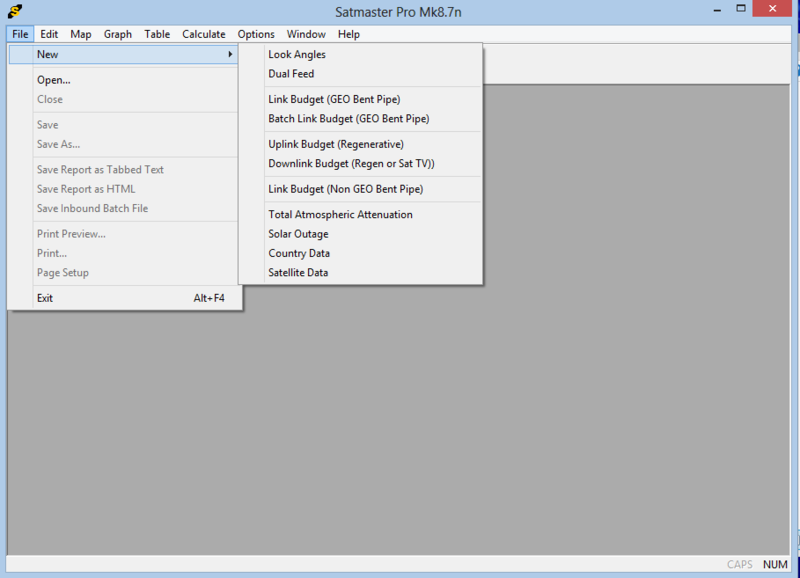 Short form downlink budgets digital TV broadcasts using GEO satellites with minimum dish size optimizer. 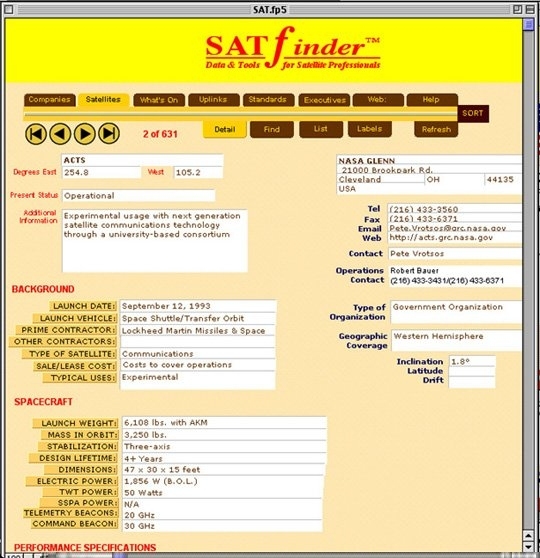 Presents accurate annual lists of date and time windows for geostationary satellite/ground station combinations worldwide. All time zones supported. Output in Local Civil Time or GMT. Please note, this module is not suitable for elderly satellites placed in inclined orbits. There is also a batch file processes to produce listings for either multiple sites, or multiple satellites, ready for pasting into MS Excel or a similar spreadsheet program. Finds relative satellite and feed spacing relative to boresight. Calculates antenna "squinting" efficiency for link budget. Execute any number of times for multiple feeds. Tabulate dual feed calculations for major towns and cities in a country with average value. 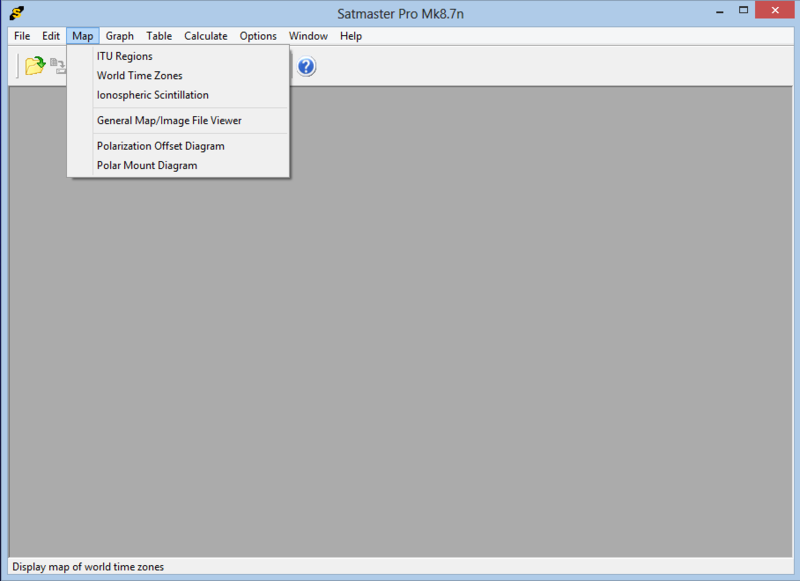 Satmaster Pro can display, scanned or downloaded, footprint maps of your choice in BMP, GIF, PCX, TIFF and JPEG formats. Locate true north/south anywhere in the world using the sun's position as your guide. Calculates modified polar mount angles for any latitude with notes on installation. Calculates overturning moment (OTM) and ballast required for a given wind speed. Assumes antenna is pole mounted using a base frame weighted with concrete blocks. Select monthly tabulations of the local time when the sun and a selected satellite have the same azimuth. Useful where local magnetic anomalies may affect compass readings. Supplied with a satellite data file and over 30,000 town and city records arranged in over 200 separate country data files. Easy browse transfer of data to input forms. 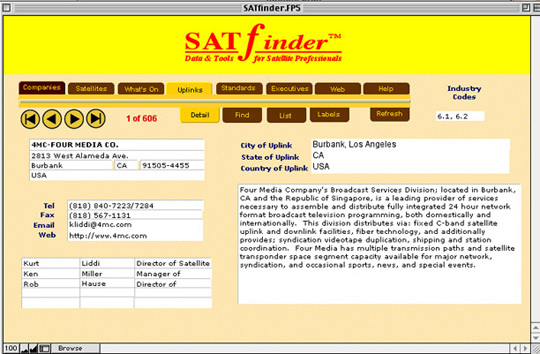 Town and satellite databases may be user edited from within the program. The satellite data is also updated about four times a year and may be downloaded from this site's front page without login. Large HTML help file. Each form or dialog box has a Help button to describe the purpose of each input field. Tabulates modified polar mount angles, antenna look angles to any geostationary satellite from multiple town/city locations in a selected country, 'visible' satellites from either a single location or two sites. Plots graphs relating to digital modulation, rain attenuation model, BER v Eb/No, atmospheric absorption, dish parabolas, lobe patterns and much more. Performs often used calculations and conversions, including antenna focal distances, rain attenuation with noise increase, off-axis gains, power spectral densities and bandwidth. Includes an editable mathematical expression evaluator. Includes convenient toolbar with speed buttons for most often used menu selections. Menu option for quick opening of the six most recently used files. Ideal for comparing 2 or more link budgets or for paired carrier (PCMA). 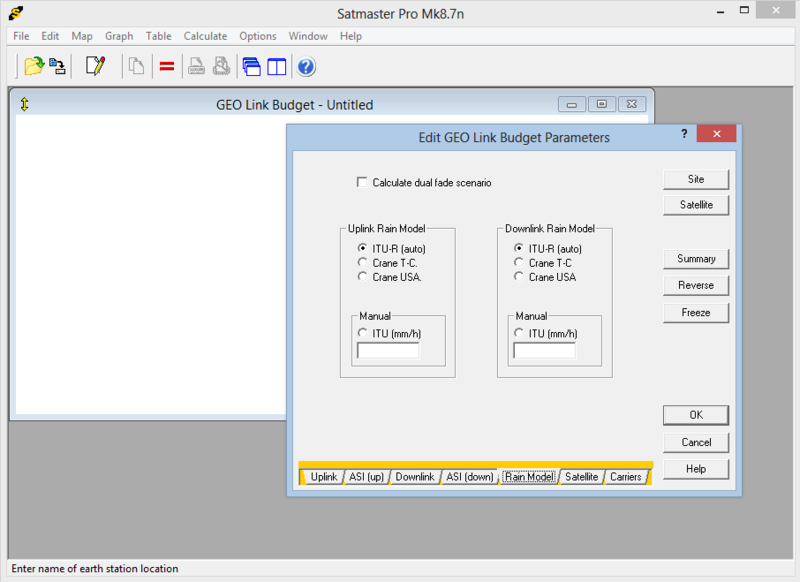 Input forms under the Graph, Table and Calculate menus have persistence of input data by default but can be turned off. 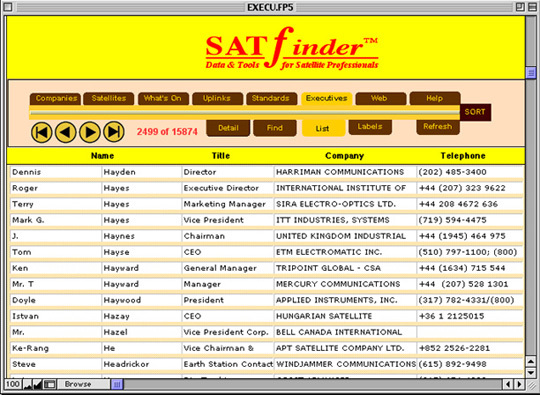 Users can search from amongst Company Information, Satellite Details, What's On Satellite, Uplink Providers, Country Standards and a full List of Executives. INTERNATIONAL AGENCIES - Government Regulators & Administrators with contact names and addresses for domestic and international public network services; Information on each country's TV & electrical standards, Cabled Household Numbers etc. ; State, Provincial & Local Authorities. SPACECRAFT - Launch Vehicle capabilities and a four year international analysis of planned launch schedules; Manufacturers of Propulsion Systems, Spacecraft, Satellites and Satellite Components. NETWORK SYSTEMS - System Integrators; Corporate & Business Networks; VSAT Systems & Management; Videoconferencing. Global Positioning System; Mobile Telephones, Video & Voice Systems; Transportable Equipment. 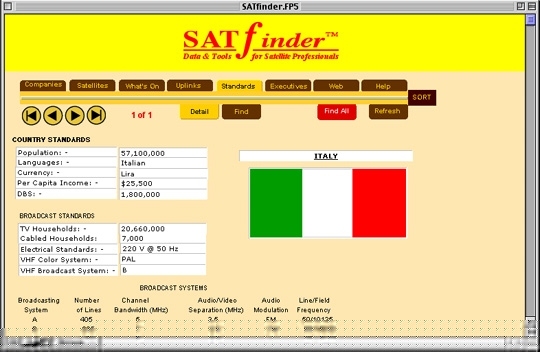 USERS AND PROVIDERS OF SATELLITE SERVICES - Satellite Programmers; Broadcasters; Major Cable Systems; Educational & Religious Programmers; Distributors of Hardware; Transmission Services; Transponder Brokers; Common Carriers - all the providers of satellite-delivered video voice and data transmission services. GENERAL SERVICES - Comprehensive contact and descriptive information on Technical and Consulting Services; Installation and Mainenance Companies, Associations; Legal Services; Insurance Brokers and Underwriters; Research Centers; Financial Institutions; Publishers. SATELLITE OPERATORS - System Operators including Intelsat, PanAmSat, Inmarsat, Intersputnik Telesat Canada, Eutelsat, Arabsat, Palapa, Optus and many others; Complete details on planned satellite systems with full details on their complex operations. GEOSYNCHRONOUS SATELLITES - Complete information on over 500 satellites including their mass, dimension, location, date of launch, number & type of transponders, users, operators, and many other relevant facts. EIRP MAPS - Invaluable EIRP, SFD & G/T color maps giving essential engineering & technical information for all operational and most planned satellite systems. This is a complete guide to all the companies that provide uplink and transmission services. Includes the location; operator name & address; satellite orientation; capabilities & services provided. Information on the standars of satellite and broadcasting which are used worldwide. Also includes general telecommunications and other useful information. Want to create a mailing list? Here are the contact details (which includes what the companies do) on over 19,000 executives. Create a marketing and sales campaign exactly designed for your products or services. All output can be directly pasted into common Windows packages, as either common delimited text or tiff images for editing, customization or to be included in other documents.